Hey everyone hope you're having a great weekend! 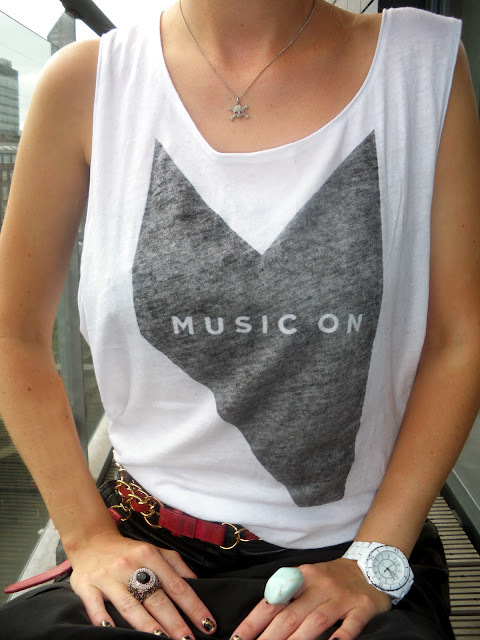 Here's my latest outfit post with my fading tan and holiday blues, but to cheer me up I'm wearing my 'MUSIC ON' t-shirt from a night at Amnesia in Ibiza. I really like the reverse print to give the washed out effect, with my leather shorts from Topshop and my red chain belt always from Topshop. I'm trying to wear my tropical print shoes as much as possible because the weather in Manchester is getting cold and wet. Sorry for the fading nail art - I painted them a few days ago and didn't put any top coat on. Base coat gold metallic, Topshop and Barry M black crackle. Toe nails are painted with Head Kandi black glitter from Models Own. Currently packing for a weekend in The Lakes to see my boyfriend's parents - lots of wine and food! T-shirt - MUSIC ON Ibiza, Leather shorts - Topshop, red chain belt - Topshop, Tropical print shoes - Next, Black blazer - H&M, Both rings - H&M, Skull necklace - Vivienne Westwood. I really like your tshirt and you're very pretty! Cool rings. Im into rings recently and need a good inspiration. Nice outfit :-), so pretty ! !